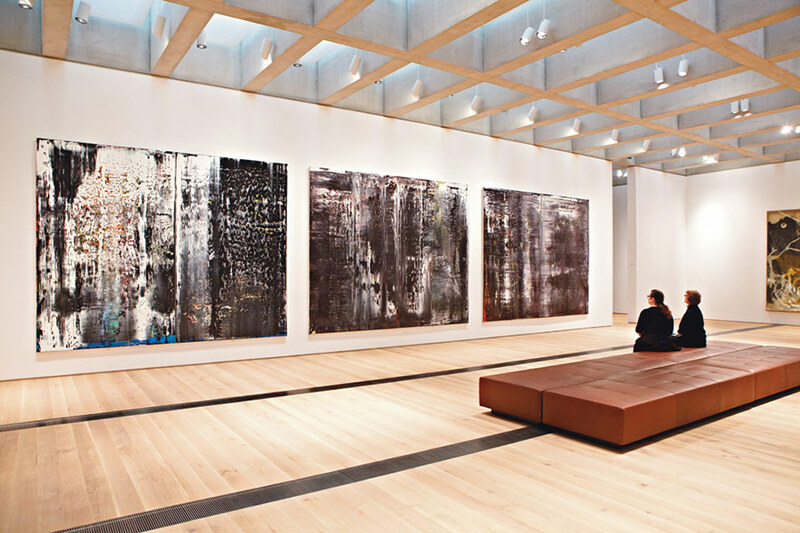 A coffered concrete ceiling laced with titanium dioxide for reflectivity and custom-designed light spreaderss diffuse daylight evenly throughout the gallery spaces. Return to the full feature article, The Art of Daylight. The building’s 16-foot-high, 40,000-square-foot cast architectural concrete ceiling is divided into a grid of 680 rectangular coffers, each four feet deep. Centered above each coffer is a skylight made of double-glazed, low-iron glass. Light enters through the skylights and bounces off the concrete, which is infused with titanium dioxide to lend the material 55 percent reflectance—nearly twice that of typical concrete. The field of skylights cannot be seen from outside. Adjoining the Cass Gilbert-designed “Palace of Fine Arts” constructed for the 1904 World’s Fair, the new East building does not trumpet its presence. Instead it is low and flat, in deference to its historic neighbor. Once light enters the skylights and bounces around among the reflective concrete, it meets the light spreaders, which are suspended within each coffer. 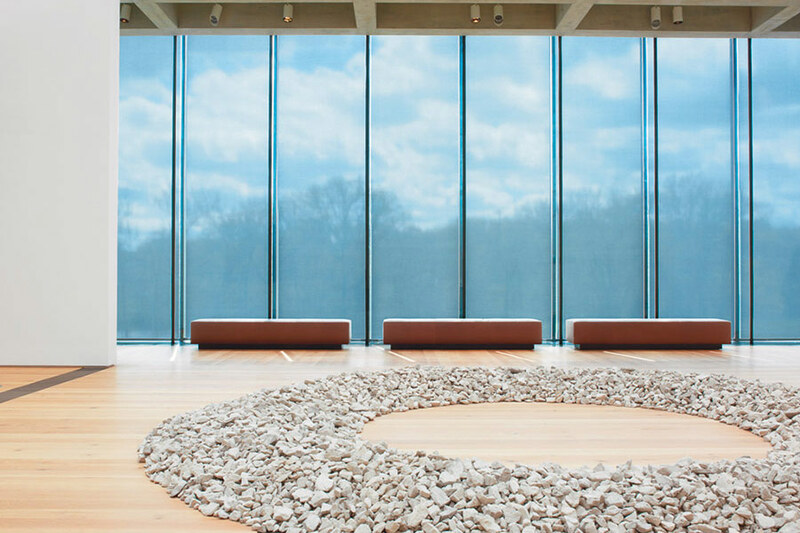 The spreaders diffuse the daylight further, creating an even distribution of light throughout the space. The light spreaders were made by St. Louis-based fabrication studio Troco. They consist of two layers—a 3form plastic light-diffusing material and a micro-perforated Barrisol fabric layer underneath—held in a rectangular aluminum frame. Between the two layers is a void that traps sound, so it also serves as an acoustical panel. By varying the density of the fabric, the design team fine-tuned the amount of light and sound reduction necessary across the ceiling grid. 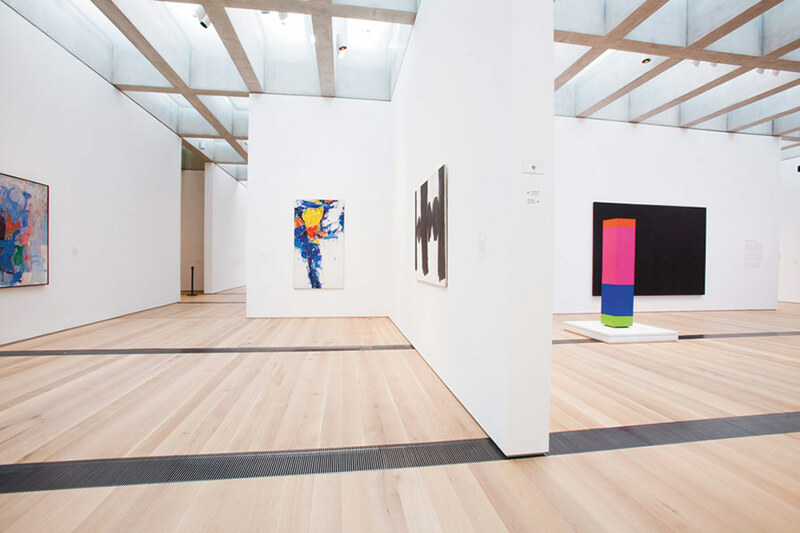 To test the system, the design team made a full-scale, 20-by-30-foot mock-up of the gallery and ceiling grid, even drawing up Mondrianesque paintings to test the appearance of different colors under the diffused light. Even after the real thing was built, museum workers tested each surface with humidity and light meters for months before the space opened to the public. 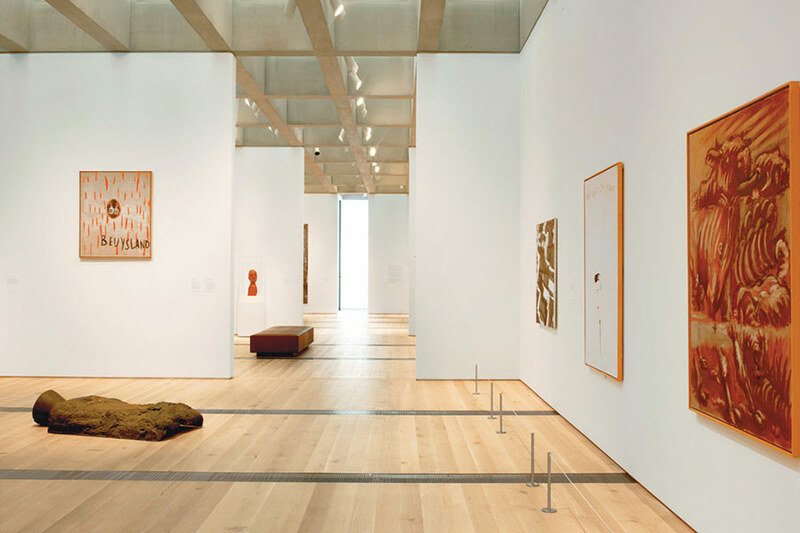 The unique lighting system traps heat near the ceiling, which helped the new wing achieve a 29 percent reduction in energy use compared to a museum with conventional systems, helping it earn LEED Gold certification. After viewing hours, the building’s automation system pulls shades over the skylights and the addition’s two floor-to-ceiling glass walls that look out over St. Louis’ Forest Park. A Hyperium software system tracks the movement of the sun throughout the day, fine-tuning with shade controllers manufactured by Lutron an assemblage of translucent and blackout shades to maintain a consistent level of light within the interior. The system also supplements the Midwestern daylight with fluorescent fixtures positioned above the ceiling coffers, which fill in for daylight during evening hours.